So a friend of mine is going to shepherd a much-needed project: an index of theological, exegetical, historical, and doctrinal writings by LDS women. 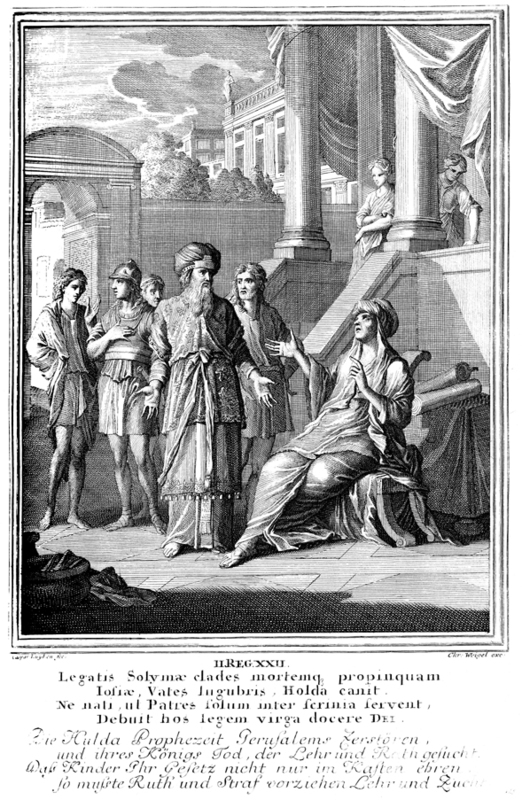 Huldah is a model for women’s explication of scripture and history. This index will make it easier for students and teachers of the Gospel to find and use works by women. I hope it will encourage younger women to engage in these fields as well. In addition to more works to seed the project, we need some help with a snappy title for the database/website. I’ve thought of “There Were Also Women” (quoting Mark 15:40), “Not Only Men But Women Also” or just “Women Also” (quoting Alma 32:21), “Expounding Scripture (D & C 25:7), or “Huldah’s Workshop.” But I bet you can come up with something better than that. So: What theological/historical/exegetical/doctrinal works by LDS women have been useful to you and deserve a wider audience? And what might we title this project? The Interpreter Foundation offers an annual prize for the best articles submitted by women. The winning article last year by Jane Birch dealt with D&C 89 and was actually quite impactful for our family, getting us started on a bunch of reading and pondering that led us to a very different diet from what we were eating a year ago. BYU’s Religious Studies Center has an author index. I imagine it wouldn’t be too difficult to skim down that and look for women’s names. I was a teaching assistant for Gaye Strathearn years ago and loved learning from her. I was just doing some browsing today and became reacquainted with the website for the Al Young studio. Elspeth Young has done/is doing gorgeous art work of women in the scriptures. I definitely thought of you, Julie Smith, because she has a lovely painting of Huldah! I don’t know if there is a need for art work by Mormon women to adorn this work but, if so, she would certainly be a good candidate to consider! I would imagine that any list might include M. Catherine Thomas. Have to think about which of her articles is best. Your metaphors were not mixed! That would require “get the seed rolling” or “plant the rolling ball”? All snark aside, this is a noble effort and hope to see it come together. We need a flood of brains and an idea storm. I love this project! There are three entries by women in the recent /Perspectives on Mormon Theology: Scriptural Theology/ from Kofford Books. I don’t know if this would count because it isn’t in a peer-reviewed journal, but I was greatly impressed by Lenet Read’s “How the Bible Came to Be,” an 8-part series published in the Ensign from Jan-Sept. 1982. What a great idea. And sad that it is necessary. If more devotional sermons would be fitting, you might consider The Challenge of Honesty: Essays for Latter-day Saints by Francis Lee Menlove (Salt Lake City: Signature Books, 2013) (edited by Dan Wotherspoon). Several papers in the close readings of various passages within the Book of Mormon by the Maxwell Institute have great papers by women. Likewise as Sharon noted several of the Kofford collections of papers on theology have great papers by women. There are others on redemption in various standard works. Not sure what qualifies for your list, but what about Fiona Givens? Beverly Campbell wrote Eve and the Choice Made in Eden and Susan Easton Black has written much church history. Julie, can you help me understand the scope of this database? “[A]n index of theological, exegetical, historical, and doctrinal writings,” could encompass just about everything. Setting aside the term “doctrine,” for the moment, are you looking for academic-level treatments of Mormon theology, exegesis, and history? Or is this a database of academic-level theology, exegesis, and history of Mormon scripture? If not academic-level, what is the threshold? If the former group, there is a real abundance of great female historians that have worked on Mormonism. I’m less current on matters of recent theology and exegesis. Josh, I loved your article–seriously fascinating. I hadn’t realized the Austin dominance of that volume, however! CJ Armga, I love the idea of including art! J. Stapley, we’re looking in the broadest possible terms, so devotional works might be included. (I think there may be a system in the database for indicating whether works are primarily academic or primarily devotional.) There is definitely a desire to include (LDS) church history. Also most of the articles in the collection “Sisters In Spirit” Eds. Maureen Ursenbach Beecher & Lavina Fielding Anderson. (Univ. of Ill., 1987) My favorites were: The Redemption of Eve by Jolene Edmunds Rockwood, Precedents for Mormon Women from Scriptures by Melodie Moench Charles and Gifts of the Spirit: Women’s Share by Linda King Newell, although there is a strong argument for ALL of the articles in this book to be included. I admit to being mildly amused that no one has even mentioned the most famous female authors in the Church: Sheri Dew and Chieko Okasaki. While they don’t use the historical-critical method, to say the least, they serve as role models for vastly more women than some of the other names mentioned. Hm. I have to admit that I’m a bit skeptical of the utility of a database that essentially contains all the works of every woman relating to Mormonism. I’d think a more targeted scope would be beneficial. If not, I’d say going through the existing databases (studies in Mormon history, journal indices, RS mag, ensign, etc.) and extracting the female authors would be the most efficient thing to do. J. Stapley, as I mentioned, the database will probably have a feature which will tag entries as “scholarly” or “devotional,” which should suit your preference. At the same time, the presence of more devotional materials is perhaps important for teachers at all levels who might, for example, want to be sure that their lesson on “faith” has quotes from female thinkers. Regarding a name for the database, my vote is for “Hulda’s Workshop” or any title that does not include the word “Also”. Please, nothing that uses the word “Also”! “Also” is suggestive of women as secondary appendages to men, second-tier scholars. This database is a great idea and will be a rich resource! Thank you! Sheila Taylor, “Hope for Universal Salvation,” Element 2:2 (Fall 2006). I agree with Joanne on the name of the database, please don’t put “also” in the title! It’s like women are an after thought to men which is the complete opposite of what you’re trying to accomplish! Love this project and undertaking though! She may have already been mentioned but one of my favorite authors and speakers is Valerie Hudson. Her article “The Two Trees” is excellent!